ACEO is an acronym that stands for Art Cards, Editions and Originals. 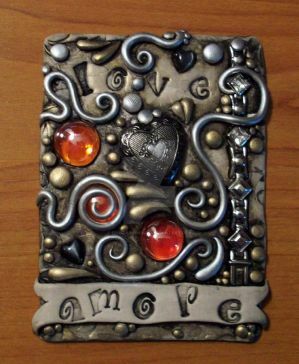 ACEOs are variants of Artist Trading Cards (ATCs) and the arconym ACEO often refers to cards that are being sold. They are usually originals, but ACEOs can also be editions of small prints or sometimes even photographs. However, here in DeviantArt term ACEO is widely used to refer all kind of cards in certain size so for sake of consistence, in this article I use term ACEO for both traded and sold cards. With ACEO there is only one rule: the card's size is 2,5 by 3,5 inches (6,4 cm x 8,9 cm) which is ideal for standard sized card-collector pockets and sheets. The cards can also be framed and hung on the wall - the way you want to store these miniature artworks is up to you! ACEOs are created by hands with any media artist desires, for example from pencil drawings to acrylic and watercolor paintings or collages. ACEOs created on flat surface are the most common - and easiest to collect and store in sleeves - but the artists can also add fabric, ribbons, gems, wood etc. to make their cards 3D. Some cards are completely made of clay or metal! There are as many styles as there are artists creating these cards. Also themes and styles are varying all the way from hyper-realistic to more stylized. The groups dedicated trading cards are often based around certain themes, for example a fandom or original characters created by artists themselves. ACEOs can vary in their size and shape or they can consist of several cards, forming for example a triptych, as long as the card can be fitted in standard size for examply by folding. Got interested and want to create your own cards and maybe try out trading? Keep reading because the best way to learn what ACEOs actually are, how to get started with creating and trading is to hear it from the artists themselves! So please sit tight and listen what they have to tell. How long have you been creating and trading ACEOs? How did you learn about ACEOs and what made you start? I made some cards back in 2011 because I had some paper leftovers of similar size... I had vague idea about these cards back then, I knew something only from what I deducted from artists' comments under few cards that appeared in my messages from people I watch. When I joined my university in 2012, I realized there will be no time (nor space in dorms room) for any bigger works, so I did some proper research and decided to try trading... So I made a few more cards so that I have something to show, and then I asked a few people, and they agreed... And I was hooked. 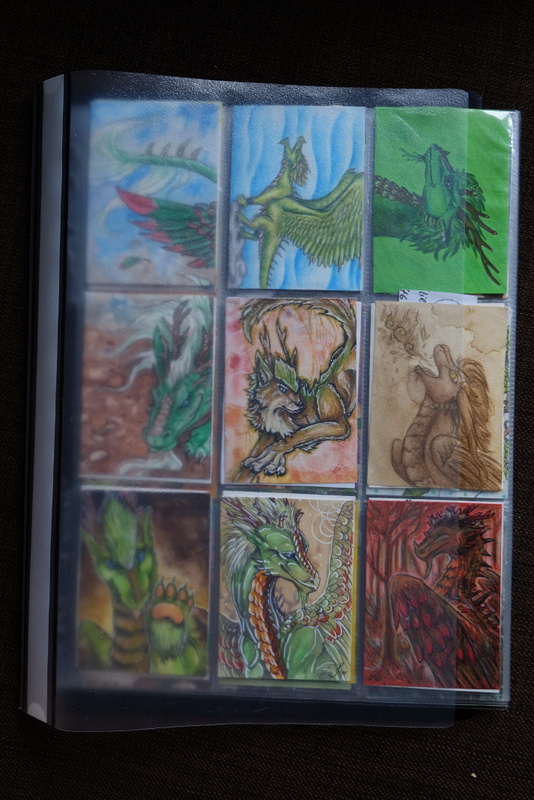 I made my first ACEOs in 2009 and have made at least one per month since March 2010. I don't remember especially where I saw the term at first, somewhere in dA anyway. Then I read more about them and just thought 'hey nice idea let's try'. I've only actually been making and trading ACEOs for about four months. I started getting interested in doing art trades, but wasn't sure the best way to do it as a traditional artist. I figured there must be a group that would help organize trades, and came upon ACEOfursXchange. I had never heard of an ACEO before, but it seemed pretty straightforward, and the work I saw in the galleries was fantastic! Everything was very organized - the trades were monthly, you got assigned a partner, and there were repercussions to not fulfilling your half of the trade so you were less likely to be burned. Plus, because ACEOs are so small, shipping them (even overseas) is cheap and easy. For around four years or so. I had seen some around various websites, mostly DeviantArt. I only started drawing and trading them when I suddenly got an invitation to an ACEO trading club on DeviantArt and accepted it. That's when I made my very first one. The first ACEO I created was made in 2008, but trading on a regular basis came two years later, in 2010. Another important year for my ACEOs is 2012, when I started to decorate the cards with a frame, which is now my recognition sign. I honestly don't precisely remember, what made me start. I remember that back in the 2008 I saw those cards at my favourite artists' galleries, such as Dragarta's, and that was the initial stimulation to try it too. However, I was only 14 years old at that time and my art wasn't very good, so the trading was rather a rare thing, done among some of my friends. The turning point was acquiring a membership in OC-Trades and ACEOfursXchange, and since then I make ACEOs quite periodically. What is the best part about trading ACEOs? Receiving an envelope and opening it, seeing the card in real sunlight, and watching the collection grow, of course... But I also really enjoy the challenge of people wanting me to draw stuff I wouldn't normally draw, like, ever. Even though I sometimes struggle, I always gain some valuable experience from it in the end! There are so many awesome things that come with being an ACEO/ATC artist, but the best is definitely getting to be blown away by the insane creativity and talent of your fellow artists! I love being surprised by a card I wouldn't even have thought to ask for. Even when a very specific theme is given, I'm usually floored by what I get! Plus, there's the simple pleasure of getting mail that isn't a bill - something I've grown to appreciate the older I get . I really love the whole concept of the cards. It is much easier to acquire a piece of art from an artist you admire, both if you want to trade it or buy it. If the artist is busy, (s)he is rather willing to agree upon such a small thing as an ACEO. The second benefit is that you receive a real piece of paper, not just the image, that you can see only on screen. Also, we all know that during the digitisation process (scanning etc. ), you may lose details and change colors, but the original is simply the original. And finally, you can collect them, one by one, and every card is different from the other and it comes from a different part of the world. I personally like to keep the post stamps, too. I think it is quite a cheap hobby with a product of a great value. Giving & getting art - art trades in small size. And easy storage. The creating process when you get to use your imagination and design a card made just for your trading partner. Also collecting lovely and unique cards from so many different artist from around the world, while being able to give them a piece of art in return. Receiving an ACEO in the mail is always nice. I think the best thing is that ACEOs are so small! Which means you can create one in only a few hours, send it quite cheaply to all corners of the world and easily store your cards in albums. And since they are quite easy to make you have greater chance to arrange an ACEO trade with your favorite artist than for example usual art trade, which takes considerably more time. Share your best tips about creating ACEOs! There's no limits of materials. Drawing/painting on paper is the most common, sure, but you can make a papercut, sculpt, sew, glue, knit, overall use different materials just the same way as any bigger traditional arts. LIMITLESS possibilities. It’s very easy to start. Actually you do not need any special accessories or tools, just traditonal art supplies you normally use and some 2.5 x 3.5“ papers. If you’re lazy to cut such small papers yourself, you can even buy some precuts (Daler Rowney makes many various types of papers for ACEOs). For sending your little originals it‘s good to buy some plastic card sleeves. And don’t forget about storing your own fabulous collection. I recommend buying several 9-pocket pages specially designed to store trading cards in binders or card albums. 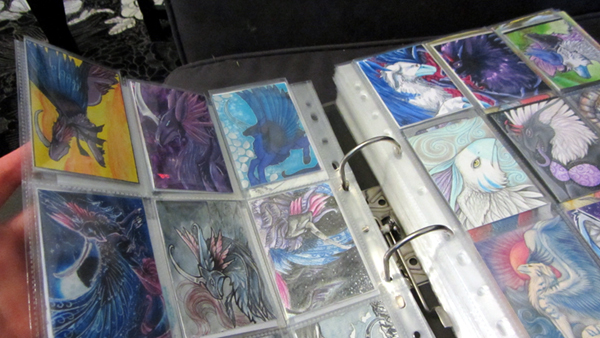 ACEOs are the same size as Hockey cards or Magic the gathering, so it‘s very easy to find fitting sleeves in stores. Creating a good ACEO is all about utilizing limited space, and (for me) going through 15 different pencil sharpeners to find the one that gives the best point. For the most part, it's much the same as a larger drawing - you want a dynamic composition, good colors and light usage, contrast, etc. The only difference is your canvas is a bit smaller. That can work in your favor, though... instead of being intimidated by a sea of blank white, your only intimidated by a puddle . Try to venture outside your comfort zone when sketching out the card. Put some thought into creating pieces with backgrounds and using various angles instead of doing simple portraits, cause that will make the finished picture more interesting. 1. When thinking how to draw your subject, get involved your heart and imagination. If you try to understand what you are drawing, understand the personality of the character and its importance for the artist you trade with, it will help you create a beautiful card with an idea and atmosphere. Even if you might not be the champion of technique you use, idea and atmosphere can make a great deal and improve your art a lot. Just think about the character as of a real creature, with is thoughts, problems, pleasures, emotions, typical activities and surroundings. 2. Think about the composition and original placement and pose of the subject. Try various perspectives, etc. 3. Remember that ACEO is a piece of your art, that should be equal to larger pictures. Don´t skimp it. People will appreciate your work, if they see you really do your best. That goes also for the cases, when you´re not quite happy with your partner´s card for you. If you want to be good, you can´t afford to make bad cards, no matter the reason. 4. Try to establish some sign or whole style typical only for your cards, so that they stand out in every collection. 5. You don´t have to rely only on drawing/painting techniques. Don´t be afraid to combine various techniques, materials and papers, and glue it together. ACEOs are small, but that doesn´t mean you can make five cards in ten minutes and everything is alright. The smaller the picture, the bigger the challenge - be creative! Find out as many things as possible about your trading partner, what he/she likes, what he/she doesn't, some information about his/her character and so on. You can make a beautiful card with a head of somebody's character, but creativity is also great. Another tip? If it's possible, see the ACEOs your trading partner got from other people and try to make something new, something what is missing in your partner's collection. And, of course, practice, practice, practice. Be patient and precise, trading ACEOs is not only about making your own collection, but mostly about making your partners happy. Uhh.. Improvise? That's the way I work, anyway But no, seriously. Boring but useful: if you want to get better at something, practice. If you want thin line, use thin marker/brush/sharpened pencil. Helps avoiding frustration! And if you want to have smooth card borders, use papercutter. What advices would you give to those people who want to start creating and trading ACEOs? You absolutely have to try it! Make a few cards, see how you cope with the small format and how you enjoy working on a card, and if you like it, I definitely reccomend to become a member of some trading group. You can make a trade every month without fear that your request will be rejected as in personal trades, you get to know some people and they get to know you. You can try drawing different subjects and practise. In case that the other artist owes you an ACEO for a long time, don't be afraid to kindly remind him. I personally have a terrible memory and would prefer to be reminded of a trade than hear a gossip that I don't fulfill my promises, etc. However, if the other artist doesn't respond or refuses to cooperate, be assertive. It may also happen that you think the card you receive doesn't have the qualities of usual artist's work and it is just a quick scribble so "there is something and the card is done and gone". That happened to me and since I worked very hard on the card for that person, I wanted some justice. If you find yourself in such a situation, politely ask the artist to improve it, perhaps you can also ask other artists their opinion to back you, if the artist refuses. That kind of problem is easier to solve, if the trade is provided by a trade group. Be brave and just give it a try. Don't let the small size of the canvas intimidate you, I'm certain you'll find it fun creating trading card-sized art. If possible, join a group or club for finding partners to trade with. Don't be afraid to ask strangers either. If you're nervous about it, maybe trade with your friends for starters. Do your research - if you want to trade an ACEO, you should know what it is! Make a few cards so that people know what they can expect from you. Next step is really simple - politely ask someone to trade with you. However, before asking for a trade, it's a good habit to always check person's homepage/journal. Many people have their trading status written in there - if they are currently not accepting trades, don't go nagging them. Not everyone trades these cards (that's why also ATC/kakao/skethc card expressions exist) so if someone only sells them, don't ask them for a trade either. Also, I would suggest joining some ACEO group. Some of them can pair you up for a trade with other people on a monthly basis and these usually tend to ban people who do not do their part or are otherwise "bad traders". That way, you can avoid some bad experience! Just do it! There are a handful of great groups dedicated to helping you find trading partners, and failing that you can just note someone you're interested in trading with. You don't need fancy supplies - I know a lot of artists who cut their own cards - but you do need to be comfortable giving out your address, and paying the postage to send out your half. Nobody wants a trading partner who cries poor when the time comes to swap. Use thick paper - ACEOs are cards, they don't work well if they're floppy. Simply start and be careful - collecting ACEOs is highly addictive! And after you‘ve finished your first cards, please do not forget to sign and date them on the back. Your trading partner will appreciate it for sure! 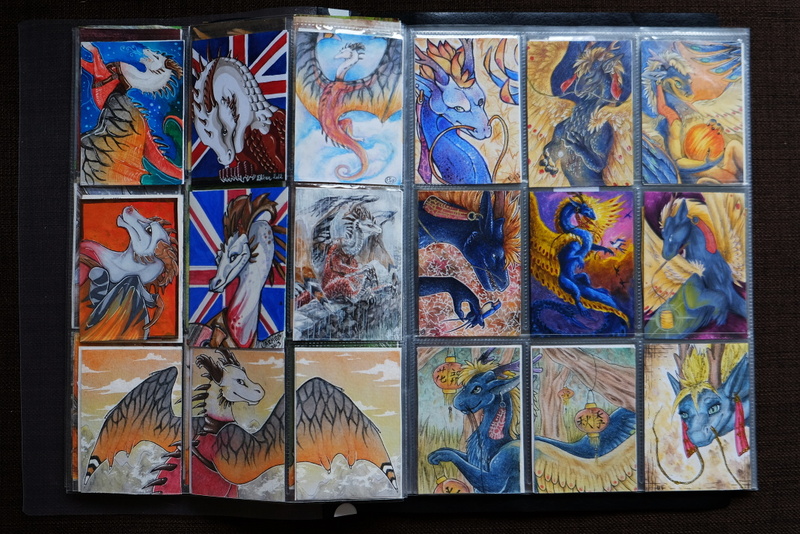 Because big part of fun is to collect the cards, I asked the artist show a picture of their ACEO collection! I have cards organized by date and by layout (landscape/portrait). One card on each album page contains dA names and country of authors of 8 cards that are on that page. I have currently reached over 180 cards! Because I just started collecting, I actually have them posted all over my cubical at work! Taupe is such a boring color, and being surrounded by it was mind-numbing. Once I run out of space, I'm going to have to get a binder and start switching some of them out. I love being surrounded by art at work. It makes coming in everyday so much more pleasant! I have them stored in folder and some are in frames around my home, I tend to switch them occasionally. I keep them in a binder. I have two collections – bigger for pictures of my character Dragarta and smaller for cards with my cat Kraken. I've taken two photos, one with the collection opened and second with collection closed. Since I have almost 300 ACEOs in three albums, I am so not going to take a photo of my whole collection - it would take ages However, if you are interested in my ACEOs, you can find most of them here. Any other thoughts about the topic you would like to say? Come on, trade, it's highly addictive. Most traders are really friendly, but it is important to communicate. And do so before actual trading, it helps avoiding misunderstandings and feeling of being cheated on both sides. Do you wish that the other person does not make and sell prints of a card that contains your character? Do you want to do your part black and white or digitally? Do you wish to keep the original and send the print? Or not send the card at all and just trade via internet? Tell it to the other person before starting the drawing. Another useful thing, especially if you trade a lot, is to make yourself a datasheet to keep track of your trades. Here is an example of mine. This way, I can make a pretty decent estimate how long it takes for card to reach to different places. When you send your ACEO out to your trade partner, for sake of getting it there in good shape, put it into a plastic sleeve or fold a paper around it, and preferably put a piece of cardboard as support if the envelope is not sturdy enough. A small card alone in bigger envelope may get awfully smudged when it moves there. I would like to take this opportunity to invite talented artists interested in trading ACEOs with various animals to join ACEOfursXchange. Our club has a quality control but feel free to hit the join button if you want to take apart . I don't know if this is blasphemous, but I actually do a majority of my trading off site. IllustratedATCs.com and ATCsforAll.com are both sites dedicated solely to the creation and trading of mail art. They hold monthly match trades, ongoing swaps, and a variety of challenges to help get the creative juices flowing, and have a very tight and active community of artists. Many thanks to ElorenArt, DanielleMWilliams, Dragarta, Forestia, kailavmp, SilveryNova and Sysirauta for taking time to answer these questions and sharing their insight about the topic! What is the most fun part of creating/trading ATCs/ACEOs? What is the most trickiest part of creating ATCs/ACEOs? Great article for those curious about ACEOs. I started doing them a few years back. I've made some just for myself, and have traded with other artists in monthly trades when I have free time. The trickiest part is deciding where to start with so many techniques and materials to use! Also, if you're using wet media, make sure you use a very sturdy surface(paper or otherwise). That's a good point what you said: depicting a subject you wouldn't normally draw! That's one reason why trades are great for improving our skills; they encourage us to step out of our comfort zone and try out new themes and subjects. And having so many techniques and materials where to choose from is definitely sometimes tricky! Oooh, reading this make creating ACEOs seem really tempting! There is a certain allure of childhood joy and playfulness in the trading and collecting part of it! I'm just wondering though, then people trade, how do they deal with the whole privacy issue of the Internet, of not giving out their real names and addresses to people they don't know? Thank you for writing this article, it was very inspiring and helpful! I never knew what ACEO stood for before, and it sounds like it something that would be so much fun to try! They are lots of fun! And must agree, there is certain charm of collecting things. Privacy is one important thing to consider when trading. It is good if you already knew the person you're going to trade with (for example from earlier conversations in the internet) and not give your contact information to the complete stranger. Also trading via groups where there is quality control and people have to apply to join are safer than just picking a random guy you know nothing about. Or you can use poste restante address or similar if you feel uncomfortable giving your address. Luckily most of the people do not want to harm other people but just trade cards all over the world. If the person had malicious thoughts I guess they'd figure out easier ways to get people's names and addresses than trading ACEOs. But like said, being careful is important and it is good to do little research of the person (i.e. browsing previous trades and feedback they have received) before agreeing a trade. Thank you for your feedback, I am glad you found this article useful! Oh, it did not know about the poste restante thing, I will look into that! Thank you so much for all you great advice, I will definitely be keeping them in mind! Awesome! I hope you'll have happy trading experiences! I'l look for the clubes mentioned. Thanks for the info! Thank you for reading, I am glad that you like! I am also happy that this article managed to explain the terms. I love this article. I love ACEOs/ACTs, and this article totally makes me love them even more, seeing all the awesome pictures of ACEOs people have made. It makes me wish to get better so that my cards could look as awesome one day. I think I've improved a little bit from the very first one(s) I made, but I still have trouble drawing and coloring on such a small surface, even though I prefer it to the larger, more intimidating blank space of a, say, 8 x 11 inch piece of paper. It probably doesn't help that I don't regularly do artwork in color, either... coloring things intimidates me, even on tiny little ACEOs! But I'll never get better at it if I don't do it, right? I love trading, though. I adore each and every ACEO/ACT I've ever received. They're all special in their own way. I'd love to get back into it someday, maybe after I've eased myself back into doing artwork with, er, actual color. Tell me about it; writing this article made me want to stop everything else and start drawing ACEOs! Unfortunately I have so many other things to do at first so that I just have to wait until some sunny day in the future... And try to maintain that zeal! Your cards look awesome already now! And hey, if you're not into coloring, who says that ACEO must be in colors? You can do amazing B&W cards as well. Oh and another idea came to my mind: why not to try making a 3D card of clay (or parts of it)! Your lil’ dragon sculptures are so adorable that they would look great also popping up from a card. But I think most people expect them to be in color. And it's so small, it seems like a cop-out not to do so. It would probably be alright if beforehand the artists agreed to do a trade of black and white or sketch cards. That might be fun. I never thought about adding clay elements to an ACEO before. Thank you kindly for the idea! That's is a good idea to agree on doing black and white ACEO so that both know what they'll get. And it would actually be good exercise where people could concentrate on shading and depth and things like that instead of throwing all the colors on the card (like I usually do. ). Looking forward to see your clay ACEO - hopefully you end up trying it out! I hope I'll get to try it out one day, too. Even if it is just for myself and for experimentation purposes. Well, puking colors is my speciality! Wow, I had never heard of this before and now I definitely want to try it! While I may never be able to trade physically due to some peculiar limitations, does anyone know if people would be willing to trade in digital scans? I can't wait to start looking into this more! Also, where could I find more clear definitions of ATC versus ACEO? Yay, it is nice to hear that you got interested! Sending originals is quite relevant part of trading ACEOs but I am sure you're not the only one who cannot send those out so I'd suggest you to ask around if people will exchange digital scans instead. These little cards are lots of fun to create even if you couldn't exchange the originals. Just make sure the person who your are trading with really understands that no originals are swapped. A rule of thumb for both ACEO and ATC is their size: 2,5 x 3,5 inches. ATCs (= Artists Trading Cards) are cards that are being traded but ACEOs (= Art Cards, Editions and Originals) can be also sold. I don't have any specific page to suggest to get more information but if you search the Internet with keywords "ATC vs. ACEO" you will get lots of results telling what these cards are and what's their history. Loved every bit of this! Great advice and info I've been trading for a couple years now and built up a collection of over 200. I've traded, purchased, commissioned, and sold these cards...so much fun! The greatest part is introducing people to the cards and experiencing new styles/drawing new characters and themes. I love the challenge of fitting a scene onto a small paper! Thanks a lot, I am glad you like! It is great to hear that it was interesting read also for "an ACEO veteran" like you! I've been ATC trading for many years, although in the places I swap ACEO is always used of cards you pay for, whereas ATCs you trade for by creating your own card for trade. So folk should probably be aware that distinction can exist, so they're not caught out if they find someone asking for moneys! I've never swapped cards through Deviant before - is it a good experience? I've used Swap-Bot, which is fast and furious and a brilliant way of getting your hands dirty; and also ATCs For All, which is a forum with a slightly bigger focus on art, but a little harder to get established. One benefit of those websites is they have a rating system, to help you feel confident in the partners you choose. If you're worried that people will turn you down because of your art is not so good, definitely join S-B or AFA because you get randomly assigned to a partner, and the emphasis is on doing your best and sending on time, rather than producing a masterpiece. But yes, I am with all the interviewees here - you should definitely dive in and start making them if you're intrigued. I'm currently collecting cards based on the place my partner lives. The coolest card I own is etched solid metal of a zeppelin. Yeah, I think outside DA people make bigger difference between ACEOs (sold cards) and ATCs (traded cards). So like you said, it is always a good idea to communicate properly to learn which case is in question! There are many groups here in DeviantArt dedicated to trading ATCs/ACEOs. I’d say it is a safe thing to do trades via groups which are monitoring that people are actually doing the cards and sending their halves and which has quality control as well. Of course it is possible to do exchanges just between individuals but before agreeing on those I’d suggest you take a look at the person’s gallery and feedback they have received to see whether they are trustworthy. I have swapped cards through the groups and always received the card as promised. I have also done lots of trades without a help of groups and there has been only couple of times when I haven’t received the other half. So like said, it is unfortunately a bit gamble if you don’t know the person you’re trading with. Swap-Bot sounds interesting, I must take a look! Rating system sounds clever and fair and people with all kind of skill level can enjoy trading. Cheers for your reply - that's really good knowledge. I will give trading here a go, I think, although maybe not yet (I'm trying to launch an art business, so I'm not going to be a great partner with other things on the top of my mind). I do like the idea of swapping in groups where you can see the other artists' work + there is some quality control. I used to get very frustrated with this, as I had a long stretch when I was sending out hand-painted watercolours and getting back low-quality stuff. I've chosen to go back to blind swapping recently because it keeps me humble - it's not so nice to be over-proud of your own work and dismissive of others as I was a couple of years back. Nowadays, I'm trying to focus on "getting cool stuff in the post" as the core of the hobby, and the awesomeness of sharing stuff with strangers, and supporting artists at whatever stage of their development because we were all beginners once. It's also impossible to tell the difference between a beginner with a lack of skill, and someone who just couldn't be bothered, so now I try to treat everyone as if they had swapped in good faith. I wouldn't ever, as one of your interviewees suggests, ask for someone to re-do a card - I would rather let a scammer go than risk hurting someone who tried their best. I think this is a roundabout way of saying there is so *much* to this hobby, I love it. You can do it to collect great art; or to hone your own skills; or just for the fun of getting mystery parcels; or connect with people internationally; because you love receiving things or because you love making gifts. It's such a rich + excellent hobby to have. Good luck with starting your art business! That's a good point: if you're trading with strangers and do not get a card that has quality you hoped for, it is impossible to know whether the artists is a beginner or just didn't bother. That's one reason why groups and DA are great places to exchange cards; you can always take a look at artists gallery and know what to expect. But like you mentioned, I also want to believe everyone tries their best like I always try to do myself. Of course I know that's not always reality, but well, it makes my life happier to live in a good faith. I totally agree the last part of your comment: there is so much in this hobby! This is an amazing article! I love these! I have a few blank ones that I need to fill, but I don't know of what yet! Ah, blank cards, full of posibilities! Good luck for finding a perfect topic to fill those with! Ai että tätä oli kiva lukea! Houkuttelee tosi paljon alkaa tehdä näitä itsekin! Kannattaa ehdottomasti kokeilla, mutta varoituksen sana: näihin jää koukkuun! Wow, nice write up. It makes me want to try it. Oh you definitely should give it a try! Yes I did! I drew my first ACEO in 2009 (and I still clearly remember my first reaction: "Omg this is stupidly small - I will never do this again!" ) now my collection is contain over 120 cards from the whole world! Some of cards I did as a commission but I prefer trading these cards because it´s always nice to get these in return (not to mention it´s going nicely along with my stamp collection). For me it´s definitelly trading the finished cards! I love collecting and looking at these. I also love creating them because for their size I can afford doing them sometimes because it didn´t eat so much time (as full pictures did). Yay, thank you! I am happy that you like! I am glad you changed your mind after your first ACEO and kept drawing these! Not sure if you remember but my very first ACEO was a trade with you so if you had stopped back then, who knows if I had ever started creating these little cards. Haha, I think your megalomaniac plans are working very well with your cards! I am usually also planning on putting a whole character on a card with full background but that usually remains as a plan and finished card ends up being something else after all... But worth of trying tho! Muistan, että! Ja olen edelleen rakastan että kortti sinulta - minulla on vielä se etusivulla albumini ja ihailla sitä (meidän pitäisi tehdä toinen ACEO neuvottelukierrosta joskus ). (I remember that! And I still love that card from you - I still have it in front page of my album and admire it (we should do another ACEO trade round sometimes ). Aww, I am glad to hear that you still like my n00b card! Thank you for interviewing me! You did a great job, that's one pretty useful and inspirational article! I also love the feeling of uncertainty, like just before opening an awesome present you receive. You never know how the card you receive will look like even if you have given certain description of what you like - it's a wonderful experience. Thanks a bunch for this journal! And thank you very much for your input! That's a good point you said: how ACEO will look in real life is always a surprise! Also even if you had seen it already online because it is hard (or impossible) to capture all the fine shades and textures when changing traditional piece to digital. And it is different to actually hold the card and look it from the different angles instead of seeing in on the screen! This was a nice article! Probably will start making ACEO'S now! Thank you! Oh you definitely should, they're lots of fun! How do we trade them? Trading is quite simple thing to do. You just have to find a person who wants to trade with you and then you agree what each of you will draw. After both of you have finished the cards, you'll exchange them so that both of you will get the original card other one drew. Some people show a digital scan to their trading partners before sending the originals while other ones like to keep the secret until the recipient sees the card in live. It is pretty much how do you agree with the person who you are trading with. So, do we send them by courier? Or normal mail if you dare. Of course it is safer to use registered letter so that it can be tracked. What fantastic interviews, thank you very much for that to all people involved! I have been hooked by ACEO since the beginning of the year...and I have to agree with so many points that were mentioned here ACEOs make you addicted, it's a fantastic way to improve quickly, because you have small space to paint, but every card is a whole complete artwork, with background, light and shadow etc. I improved so damn much this year, all because of painting many ACEOs. I definitely prefer trading, but I have also bought 2-3 ACEOs so far, and I will give out ACEO comissions to a few artists when I have the spare money. Collecting is great fun, but also the process of planning and creating a part...not to mention the pure joy when you get mail from all over the country, maybe sometimes with small goodies in it And I love writing letters and also creating small goodies myself. EDIT: Oooh, and thank you fellow artists for showing a part of your collections, I'm always incredibly curious about that! I am happy to hear that you liked the interviews! Thank you also for sharing your experiences about ACEOs! I agree, these little cards really are addictive and with help of them it is fun and fast to improve our art. It is easier to challenge ourselves to try new things when there isn't big, white canvas to fill but only a small area. Like you said, it is definitely a challenge to try to squeeze a full body winged dragon into a card. Traditional Art Feature and Feedback Contest - Win Prizes! Take a look at your favorite collections, browse traditional art gallery for brand new artworks or dive in archives to find beautiful pieces that capture your eye. Then, step back and take a good look at your findings. What is the thing in each work that speaks to you? Is it the work's concept or technique that attracts you? Or does its atmosphere or style take your breath away? Has the artist tried something new successfully? Write these thoughts down and feature them among the artworks! This contest is about sharing artworks you enjoy and also thinking further about why you like a particular artwork. Read below the rules how to enter - you have about 5 days time to compose a winning feature! Traditional Art Week at projecteducate has come to its end. We hope you have enjoyed the week with us, learned new things and found inspiration! Many thanks to the contributors and everyone who participated and made this week happen! Thank you also for all the readers and visitors who stopped by and left feedback. Watch ForeverI have been in DeviantArt over seven years and during the years I have been fortunate to meet lots of awesome people here. I haven't met anyone of these amazing human beings personally, yet, but I hope that some day I will. I am highlighting a few from my watchlist - people I am going to watch forever. Eleweth is an awesome and determined person and every time her art pops up my message center, I am thrilled to see what she has created. Her skills and style are beyond gorgeous so be sure to make visit her gallery and say hello to her! Our brains get in our ways sometimes when we draw. You'll get a spark of inspiration and suddenly it's gone. You might be so focused on one area that you completely overlook an obvious mistake. Or worst of all: you have a metric ton of ideas of stuff to draw at three o' clock in the morning (srsly, I hate that). Today I'll explain the scientific reasons your brain can sometimes work against you while you're trying to art and some exercises to beat that know it all brat into submission! Just look at it. Dancing. Mocking us. Traditional art offers you amazing chances to experiment with various materials and techniques. Don't be afraid to mix whatever you can – with everything (even with non-artistic materials) you can create amazing stuff! I want to show you some good combinations I often use while creating my pictures. When starting out in traditional media it can be a little intimidating to decide upon what medium to start or try working with. After seeing what some amazing artists can do with these traditional tools, it may be difficult to choose which one to try out. This article endeavours to cover two such mediums, Copics (an alcohol based marker) and watercolours (a water based paint), starting to compare them for the newcomer. The initial cost of any traditional medium can be expensive as several things need to be purchased at the same time. There are often cheaper alternatives to the paints and markers that can be substituted. Art block and the lack ideas is a very common thing for an artist, there are many ideas and ways to help over come art block such as this fantastic article PE: Your Worst Enemy. This article will be listing some ideas to start your own personal project and ideas for small collaborations. A personal project is something undertaken by an individual to achieve a goal. A series of art pieces (visual or written) that are part of a theme or goal can tell a story. (Example: PE: Telling Stories with your Art). Equally a series of artworks or a theme can do the same. Heya! my lovely deviants and watchers! I'm back with another article to present to you! This time it is about sketches. We all make sketches that we love of fantasies, fan art, or portraits. But, while drawing, if we reach a certain point and then make a mistake, our sketch is destroyed forever! (Unless you have a personal time machine and you go back in time to tell yourself not to make that mistake again ) So, until scientists invent the time machine, I will present and discuss three very common mistakes that we all make and how to prevent their occurrence. Mistakes and Prevention StepsA Word of Thanks!